Mary, along with K-9 partners “Willow,” “Badger”, “Buddy”, and “Robin”; were all proud members of Kinzua Search Dogs. 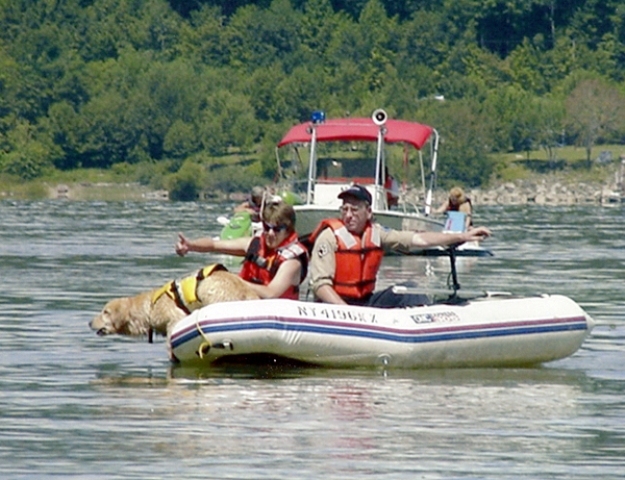 Kinzua Search Dogs is a not for profit, 501 (c ) 3 all volunteer Search and Rescue dog team dedicated to the effort of locating missing persons. 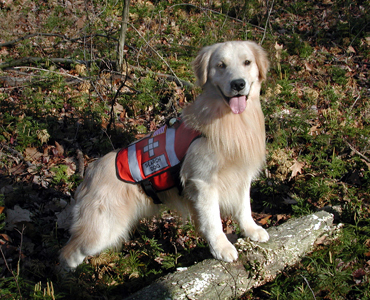 Based in southwestern New York, Kinzua Search Dogs conducts searches in New York State as well as Pennsylvania. Robin also had the privilege of serving as a Search and Detection K-9 with "partner" Deputy Mary MacQueen, in the Salamanca Police Department as well as the Cattaraugus County Sheriff's Office. 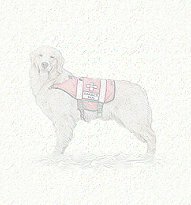 Search and Rescue K-9 Willow was a female Golden Retriever who started her career in Search and Rescue (SAR) work in early 1999. Willow was introduced to the world of SAR at the tender age of 8 weeks. Being introduced at such a young age allowed Willow to build a very strong foundation in SAR work. Willow and Mary spent as many as 25 hours each week reinforcing the basics of finding human scent (both live and cadaver). Willow had an extremely successful career and worked well into her senior years. Willow and Badger were started in the "air scent" discipline, which means they are trained to find ANY human scent being carried on air currents. This method of search work is particularly handy when trying to locate a subject who's starting point is unknown. It is also imperative for ruling out areas in question within the probable search zone. It is not necessary to have a scent article from the person to do this type of searching. Mary, Willow, and Badger were fortunate to have had the assistance of several different SAR dog teams and training experts in order be tested and gain certification in this discipline. "Mary and Willow High Angle Training"
Willow was also been trained in the field of off lead trailing, which allowed her to follow a specific persons scent to the source. A scent article from the missing person is very useful in this type of search. The advantage to off lead trailing is the amount of time saved by allowing the dog to range out from the handler on it's own at the dog's pace. Once the find is made, the dog returns to take the handler back to the subject. Other disciplines in which Willow and Badger have been trained include cadaver search, water search, building and debris search, and snow burial. Robin and Willow were the K-9 specialists within the Cattaraugus County Sheriff's Department. While Willow specialized in Mantrailing, Airscent and water search, Robin excelled in Narcotics, scent discriminating Mantrailing and Human Remains Detection. Both of these exceptional K-9's received their high levels of training from Mary, and at various training classes across the country. In 2002, Willow had the privilege of being 'cover girl' for the September issue of Dog World Magazine. 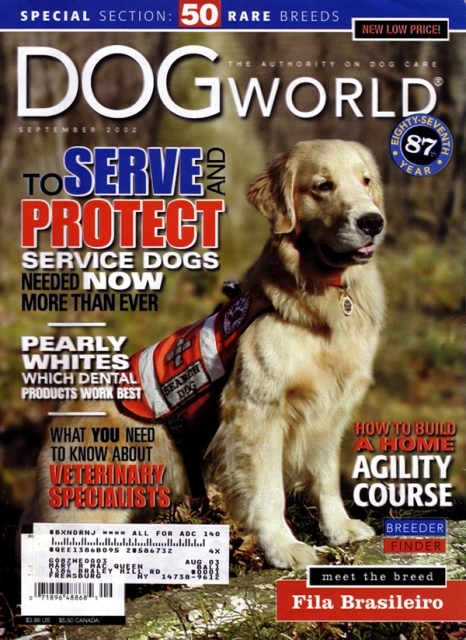 It was the anniversary issue in tribute to 9/11, and showcased the training of Search and Rescue Dogs. The article featured numerous photographs of both Willow and Buddy in action. 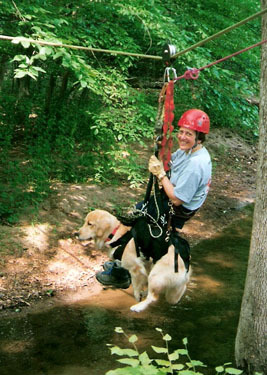 Robin and Buddy were also featured in the Popular Dogs Series Magazine's February 2005 issue of Training Secrets for Golden Retrievers. The article referenced the in depth training techniques needed to prepare a Search and Detection dog for duty. Nitro Golden Retrievers feels truly honored to have had such high achievers as Willow, Robin, Buddy and Badger in their ranks. Proud members of Kinzua Search Dogs!